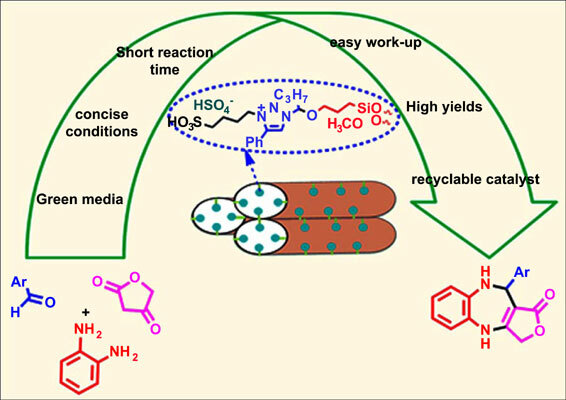 Aim and Objective: A novel and convenient transformation for the synthesis of benzodiazepines has been developed via catalytic cyclization reaction using ionic liquid supported on mesoporous silica nanoparticles- imprinted iron metal (Fe-MCM-41-IL) as a recyclable catalyst under mild conditions. Materials and Methods: For preparation of Fe-MCM-41-IL, FeCl3·6H2O was added to a mixture of distilled water, CTAB and NaOH aqueous solution. The tetraethyl orthosilicate was dropped into the solution under stirring. The product was separated, washed, and dried. The solid product was collected and calcined. Then, to a solution of β-hydroxy-1,2,3-triazole in toluene, 3-chloropropyltrimethoxysilane was added and the mixture was refluxed. The Conc. H2SO4 was added dropwise into the above solution and stirred. For immobilization of IL onto Fe-MCM-41, the solution IL was added to Fe-MCM-41 and was refluxed for the production of the Fe- MCM-41. Following this, benzodiazepines were synthesized using Fe-MCM-41-IL as a catalyst. Results: The Fe-MCM-41-IL was prepared and characterized by a different analysis. The activity of the prepared catalyst as the above described was tested in the model reaction of o-phenyldiamine, tetronic acid, and different aldehydes under room temperature in ethanol solvent. Also, the catalyst could be recovered for five cycles. Conclusion: We developed a novel nanocatalyst for the synthesis of benzodiazepines in excellent yields. Fe- MCM-41-IL as a catalyst has advantages such as: environmental friendliness, reusability and easy recovery of the catalyst using an external magnet. Ionic liquid, mesoporous, Fe-MCM-41-IL, nanocatalyst, benzodiazepines, synthesis.